People, listen up. Buying your lady (or man) flowers for Valentine’s Day is a nice gesture, but it’s also kind of a cop out. Essentially, you are saying I took the time to spend $40 on you. Especially on days like Valentine’s Day, it’s just too easy. Now, some may very well expect and love flowers so I’m not saying not to get flowers. But, if flowers are your default, just because, then try something different this year. That different thing may very well be this Strawberry Chocolate Shake. While you could start with strawberry ice cream, I find the flavoring in most strawberry ice creams to be a bit over-the-top. 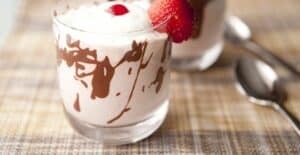 Instead, take the time to start with fresh (or frozen) strawberries, make a quick syrup, and blend that together with some high quality chocolate and vanilla ice cream. It turns out that you’ll lose that fake-pink coloring this way. It’s replaced by a more subtle pink hue, but the flavors are wonderful. It’s a different beast entirely and one that I think anyone would love for a special treat. A fantastic romantic dessert with fresh strawberries and high quality chocolate blended together and served with whipped cream. 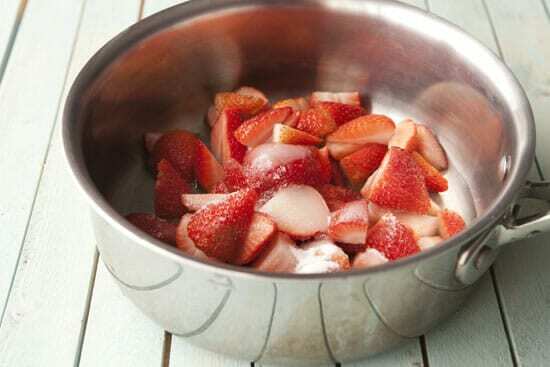 For strawberry syrup: Combine strawberries, sugar, and water in a medium pot and bring to a simmer over medium heat. 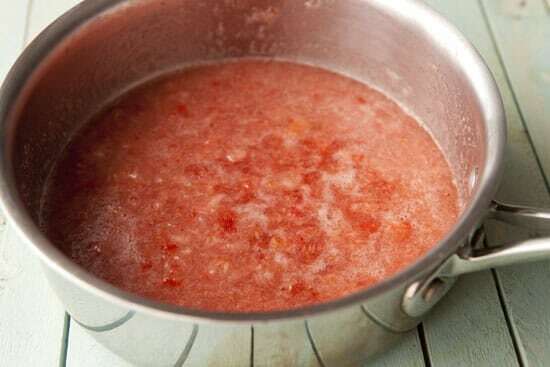 As it simmers, lightly mash the strawberries and cook for 6-8 minutes until it thickens a bit, then let cool to around room temperature. 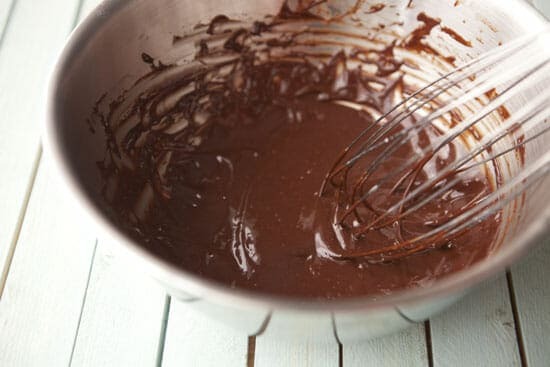 For chocolate ganache: Combine ingredients in a metal mixing bowl and place over a small pot with simmering water. 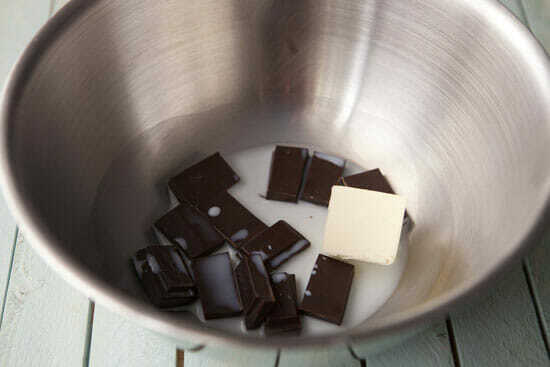 Stir the chocolate until it melts evenly with the butter. If the mixture gets too thick, use a little more milk to thin it. 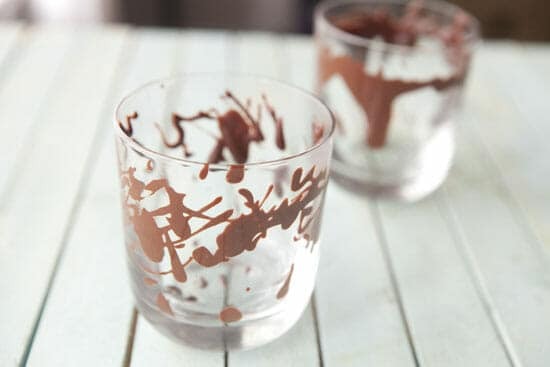 When chocolate is even, drizzle into serving glasses or use to dip strawberries in. For whipped cream: Combine ingredients in a medium bowl and whisk like crazy until it holds stiff peaks. Chill until needed. 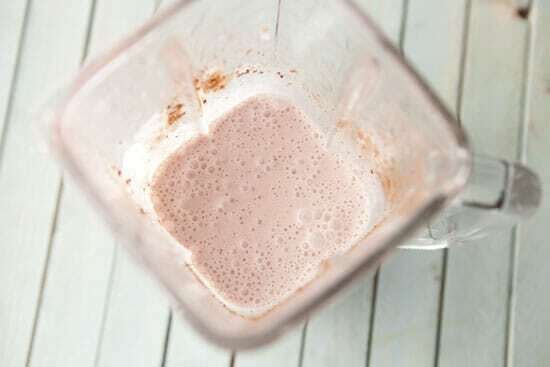 To make milkshake: Add ice cream, milk, cocoa powder, and strawberry syrup in a blender (you’ll have some syrup left). Pulse until smooth. Pour milkshakes into chocolate-drizzled glasses and top with whipped cream. Garnish with cherry or chocolate covered strawberries. It would barely be a recipe if I said: Grab some strawberry ice cream and blend it together with milk and chocolate. 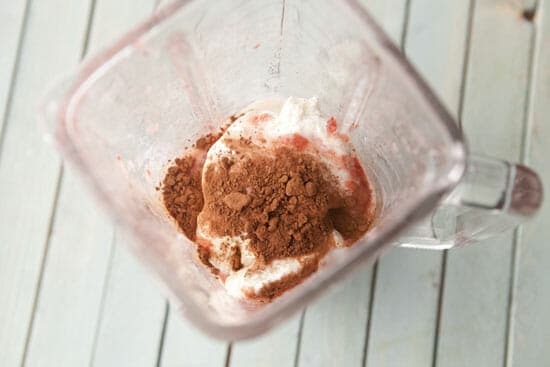 This Strawberry Chocolate Shake would be infinitely better in the spring with perfect, ripe strawberries, but even using the ones you can find in the store (or frozen ones) you’ll be in good shape. To start the syrup, just combine the ingredients in a medium pot and heat over medium heat. Once it’s simmering, lightly mash the ingredients together and let it reduce for a few more minutes. It only needs to cook for 6-8 minutes total. I used a potato masher to give mine a few mashes as it cooked. After 10 minutes or so. By the way, you can pour this syrup over vanilla ice cream just like this and it’s way good, but we are going a step further. You don’t need a ton of chocolate for this Strawberry Chocolate Shake recipe if you use good stuff. 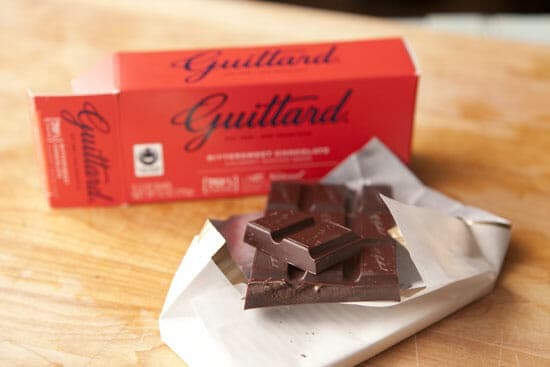 This was what I used and it was very good, but any semi-high end semi-sweet chocolate will do the trick. I wanted to make a quick ganache to dip strawberries in and also line the glasses with. This is definitely an optional step. Most of the flavor in the shake comes from the cocoa powder actually so this is just a bonus, but if you have the time, it’s a nice touch. Whisk the ingredients together over a small pot of simmering water. The double boiler will quickly, but softly melt the chocolate and butter and you’ll end up with a super-smooth chocolate. It’s perfect for drizzling or dipping! I drizzled some in two glasses for an artsy design. I used small glasses because the recipe makes two small shakes. It’s meant to be a treat, not a meal! This is far from rocket science. Combine some ice cream with milk, cocoa powder, and a good amount of the strawberry syrup in a blender. The strawberry syrup should be room temperature or it will just melt all the ice cream. Blend blend blend and you’ll be left with a pink-hued beauty of a shake. 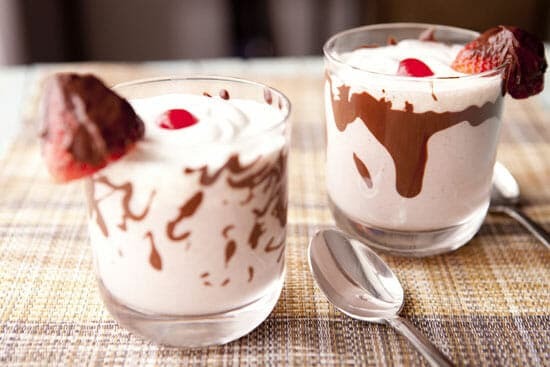 Pour the shakes into the glasses and garnish with whipped cream, a cherry, and maybe a few fresh strawberries. You can dip them in the same chocolate ganache for an added touch. Milkshakes in winter? Any time. Milkshakes are a bit tricky to photograph unless you are using food stylist tricks (hint: you can’t actually eat them that way). While it’s always my goal to make stuff look amazing, this Strawberry Chocolate Shake tasted way better than it looks. That’s all there is to it. Ok. So maybe still buy flowers. I don’t want to be the cause of relationship strife. But, make these shakes also! What a great idea! My wife is allergic to flowers so this would be a wonderful treat for her. Thanks for sharing! Do you think this could be made with raspberries instead? Absolutely. I would say you wouldn’t need to change the recipe at all actually. The only note I’ll make about raspberries is that they have a ton of small seeds that really only show themselves if you make a syrup. If you have a small mesh strainer, it’s probably worth it to strain the syrup just to remove as many of those seeds as possible to keep your milkshake nice and smooth. :) Good luck! « Homemade Trials: Tortilla Chips Recipes Home » The Internet Kitchen: Under Contract!